All things galaxy are increasing in popularity. We’ve seen so many galaxy themed soaps and finally tried our hand at the technique. 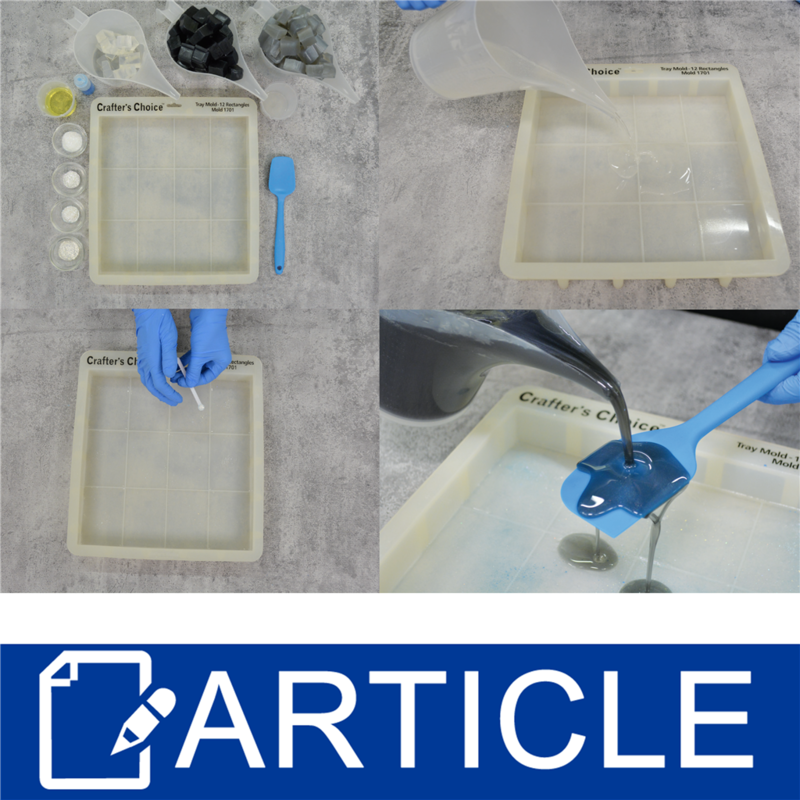 Here are our tips and tricks for creating a galaxy designed soap using Crafter's Choice Tray 12 Rectangles Silicone Mold 1701. Start by gathering and measuring all your ingredients. You’ll need to work fairly quickly, especially in the beginning steps, so it helps to have your workspace organized and all of your colors within reach before you get started. Begin by melting enough clear soap to cover the bottom of the mold completely. We did not add any fragrance to this portion to keep it from clouding, but we did add some iridescent glitter! Spritz the mold with rubbing alcohol to help the soap spread and then quickly pour your melted soap into the tray mold. Make sure the entire base is covered, even if that means shifting the mold around. Remember to spritz again with rubbing alcohol to pop any surface bubbles! Start with one or two colors, and scatter them around the mold. We found it was easiest to use a 0.15 ml Micro Size Scoop and simply tap the side of the scoop to get our sprinkles of color. Repeat the same process with your remaining clear soap and the remaining colors. Don’t forget to spritz with alcohol! Also, pour the clear soap over the back of a spatula. 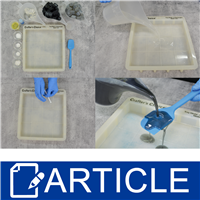 This will help to disperse the soap and not move around your first layer of your design. When you are finished sprinkling the second layer of colors, use the powder sprayer of blue mica. We only sprayed in sections of the mold, this creates more of a unique design instead of a uniform layer of color. When creating your design, remember there is no correct or incorrect way to do it! Look at other soaps or photos for inspiration and do what feels natural to you! After your design is created you can start melting your black and silver soap. The mix & pour funnel pitchers work great for making a swirled look in the background! Wait for the temperature of the soaps to be approximately 140ºF before pouring. Again, starting with the black soap, pour over the back of a spatula. Only pour about one-third of the black soap and then start alternating pouring black and silver. Moving the funnel pitchers while pouring will help the soap to swirl. Remember to spritz with rubbing alcohol after all of the soap is poured, and then allow it to harden completely. 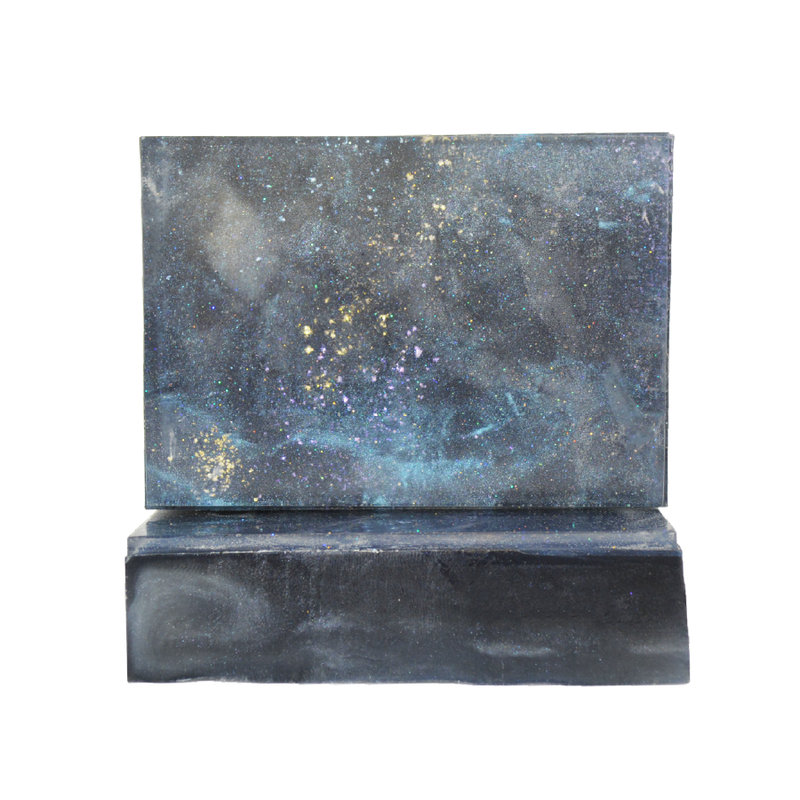 When you unmold and slice the soap you will have a unique galaxy design in each bar!